Where Do You Wear Your Paint-Pot? CLICK for the shape of the vessel. One of the icons that best elucidates the description of scribe or artist in Maya painting and sculpture is a device worn behind the ear or tucked into the headdress. 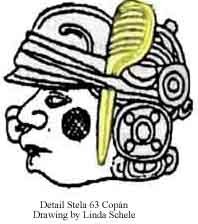 This device is seen on a number of Codex style, polychrome, and incised vessels, and also on the famous sculpture of the scribe from Copán. All of the scribes, carvers, and artists that wear the symbol are supernaturals. The device is often oval in shape with an e longated section at one end. It may be marked with a mirror or double "dark" sign reminiscent of an akbal glyph. There are variations in the shape of this icon, which may reflect regional differences, but they are all worn similarly, behind or near the ear. Other attributes, such as netting, brushes and bundles, which identify scribes and artisans, both supernatural and mortal, may appear. All of these devices are worn tied to, tucked into,or otherwise attached to the headdress. In The Maya Book of the Dead, Robicsek and Hales describe the supernatural icon as large deer ears (pp. 61-63). In The Blood of Kings, Schele and Miller also describe this device as deer ears (p. 142), and to quote Dorie Reents-Budet writing in Painting the Maya Universe ..."a deer ear tucked behind the artist's ear..." (p. 41). I believe that the identification of the scribal icon as a deer's ear stems from the fact that various characters wear a deer's ear on Codex Style vases published by Robicsek and Hales, (Vessels 14 and 15, K1559 and K1182). It should be noted that in one case the deer's ear is marked with a cross design (band-aid) and on the other a caban sign. 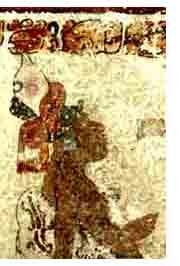 None of the characters that wear the deer's ear on Codex Style vessels are portrayed as scribes, but there is good evidence that these images are associated with the deer in various Maya legends. I have long felt that this icon is not a deer's ear but an object associated with the task of the scribe. At one time I suggested that this icon was a feather, thinking possibly that the Maya scribes used quill pens, or following Felipe Dávalos' suggestion that the Maya artists used the edge of a turkey feather to paint some their exceedingly fine lines. Recently, Michael Coe in the sub-chapter entitled "Quill Pens" in The Art of the Maya Scribe, presents new evidence that quill pens or reed pens were used by the ancient Maya.1 There are a few vases picturing scribes where feathers are worn in their headdresses. However, these vases are from the highlands and may show a regional fashion of wearing feathers, rather than scribal attributes. Neither of these two suggestions, the deer's ear or the feather, could be substantiated from studying the icons in the paintings of scribes to which we have had access. On this vase (K6552), the tip of the paint pot worn in the headdress, rises into the rim text and points directly into the hieroglyph which Barbara MacLeod and others have been able to read as kuch or kuch-ah meaning "burden", "storage place," "container," and "place for liquid. "3 Nikolai Grube makes the point that in Yucatec the reading for this glyph is kuch abak. 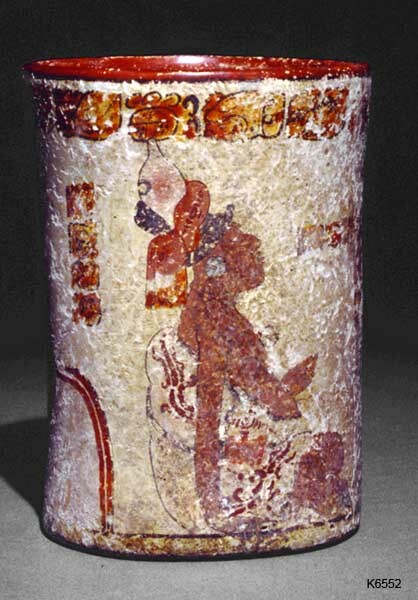 The ceramic representation of a paint-pot from Tikal (K6580) carries the same glyph as the glyph on vase K6552. It becomes apparent then, that the icon Maya artists were painting and attaching to scribes does not represent a deer's ear, but rather represents that most important part of the scribe's equipment, his paint container. Barbara Kerr has pointed out, that generally on vases, where the scribal icon is present behind the ear, the paint container is not present in the scribe's hand. I would also suggest that the scribe might have also been a storyteller; one whose function was not only to place words on paper, pots, and stone, but to verbalize the stories as well. This function as storyteller may have had political implications. Who would have been better equipped to accompany a royal messenger or to have been the messenger himself, than a scribe? The ability to use words and to be able to keep records, create documents, to sum, is almost magical and would raise such a person to shamanic levels. The figure on Stela 63 wears the paint pot in his headband, identifying him as scribe; also, on an incised vessel from Copán (K2873),5 the objects that the scribes wear echo the shape of the Olmec "spoon." E. Willys Andrews described in a paper (I have no citation), the evolution of the Olmec "knuckleduster" from the conch. Included in his discussion was the evolution of the "spoon" from the same shell source. 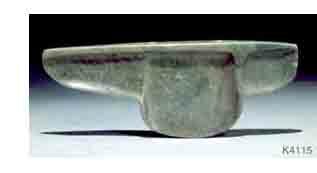 It is not too far a leap to suggest that the Olmec prepared their paint containers and palettes from the sections of a conch, and then carved symbolic jade versions of the same implem ents. 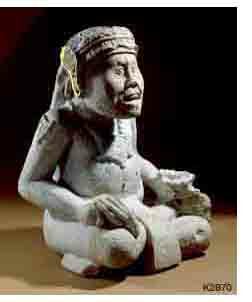 The Olmec wearing of the "spoon" (which is usually drilled to wear as a pendant) may then be a indicatorthat its wearer was literate. His ability to record the words and images of the gods and know their functions would make him an indispensable person to the community and its leaders. It is interesting to note that the symbol of the Maya scribe may refer back to the Olmec, which describes their art as an ancient one. This paper was first presented at a meeting of the Precolumbian Society of Washington, DC on October 6, 1994. Since the first presentation of this work, an artifact has come to our attention which is worth describing in the context of this paper. A small pendant (7 cm in length and 3 cm wide) in the shape of an open hand with four fingers bend inward towards the palm. The pendant has two drill holes just underneath the fingers and if suspended from those holes, the object would hang vertically. This pendant is very similar to the shell paint container illustrated in Painting the Maya Universe, p. 43, which is almost the size of a human hand. It suggests that the ah itz, that is, the scribe or one associated with the scribal arts would have worn such a pendant as a symbol of his rank or duties. This seems to coincide with the Olmec practice of making "spoons" function as pendants. There appears to be then, a number of symbols and objects which define the scribe, the ah itz, the ah k'u hun, all members of the tribe of communicators who hoild a very important role among the ancient Maya. The author wishes to thank Barbara Kerr, Dr. Sandra Noble, Inga Calvin, and Dr. Kent Reilly for having read a first draft of this manuscript and for their input and suggestions. All errors and misinterpretations are those of the author.